Arborist Gear Elk River Fall Arrest Lanyard 52"-72"
Elk River Fall Arrest Shock Absorbing Lanyard Stretch 52"-72". 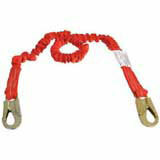 In case of a fall the NoPac Energy-Absorbing Lanyard reduces the impact by arresting force to less than 900 lbs. Equipped with locking snap hook on both ends that meet ANSI Z359.1-2007 for a 3600 lb. gate. The Stretch feature is an elastic bungee. This reduces the size of a 6' lanyard to about 52" greatly reducing the chance of tripping over it.